I decided to do this little "journal my faith thing". I was compelled to do this through two blogs that I have stumble upon this past week. I have thoroughly enjoyed reading them. The first one Homegrown Hospitality by Stephanie Ackerman. By reading Stephanie's blog, of course, led me to the next blog Telling Stories by Courtney Walsh. I recommend you stopping by them both to get a dose of inspirations from time to time. It will be hard for me to do a post every week. Or at least it will be hard for me to get in the habit of doing it!! I have been wanting to do some type of weekly/(possibly daily-haha) blog sketch for a while. I feel like it will help me get my mind in the creative gear I need it in. Working as a full-time artist, it is very hard to draw the line between fun creativity and deadlines! Unfortunately, the fun creativity does not always pay the bills! 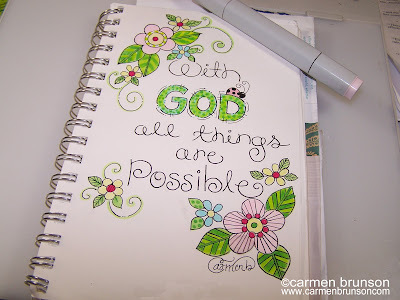 Going back to the post...Courtney, on her blog, encouraged her readers to scrapbook, journal or document your faith. I do scrapbook, just not on a daily basis. I usually do not get to do that until our scrapbooking trip that is scheduled twice a year. However, I do draw ALL THE TIME! Quite necessary for my line of work! So mine will just have to be creative drawing stuff. For the past year I have felt God moving my career in a different direction. When God places a dream, a goal or calling on your life, the first reaction we have is "Oh my! That is so much bigger than me, I can't do that!" Then all the "What ifs" flood your mind. My devotions today led me to (Luke 1:37)KJV "For with God nothing will be impossible." When I opened my bible to turn there, (Mark 10:30)KJV jumps out! 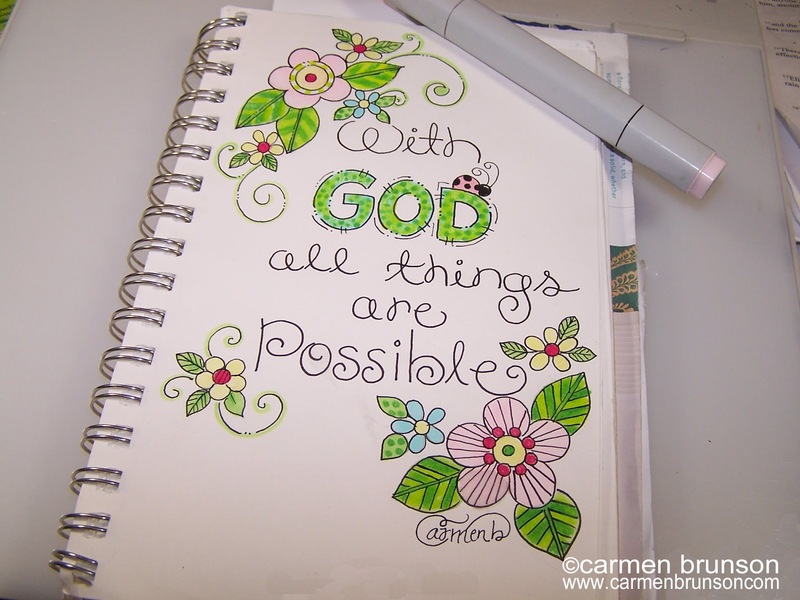 "With men it is impossible, but NOT with God; for with God all things are possible! I love these GOD-cidences as I call them. When he lines up scriptures in a day and they just fall in front of your eyes. I know that he is saying..."Just chill...I have this!" In my devotion today God tells me "Nothing is too difficult for Me. I have chosen to use weak ones like you to accomplish My purposes. Therefore, do not fear your limitations or measure the day's demands against your strength.Talk with Me, and listen while I talk you through each challenging situation. "~Jesus Calling devotional. What He requires is that I stay connected to Him. So enjoy your life...God has this! Have a blessed week!